I have Resharper 6 (build 6.0.2202.688) with VS2008 and the intellisense on aspx pages doesn't seem to work properly for <asp: tags. I select asp and if I press the tab key to complete the tag asp: or continue typing once the : is typed I don't get a intellisense menu for the controls (buttons, labels etc) I have to either press CTRL + Space or backspace and re type the : for the intellisense menu to pop up for me to complete the button or label tag. 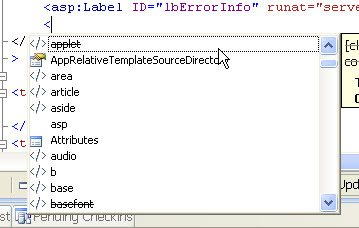 Is this how it is meant to work or should the intellisense pop up automatically after the asp: is completed. Thanks for report. Issue is logged http://youtrack.jetbrains.net/issue/RSRP-274204.